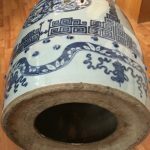 Late Ming/early Qing Dynasty, porcelain. In excellent condition. 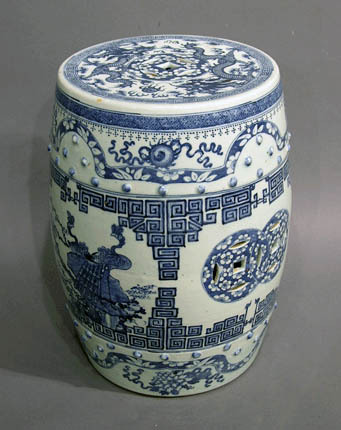 19” h. 15” w. d.
This barrel-shaped garden seat is painted in the Ming style, on transparent white porcelain. The seat top has a pierced cash symbol in the middle surrounded by two sinuous four- claws dragons chasing a jewel among motif of clouds, symbol of wish for riches to rain down from heaven.. 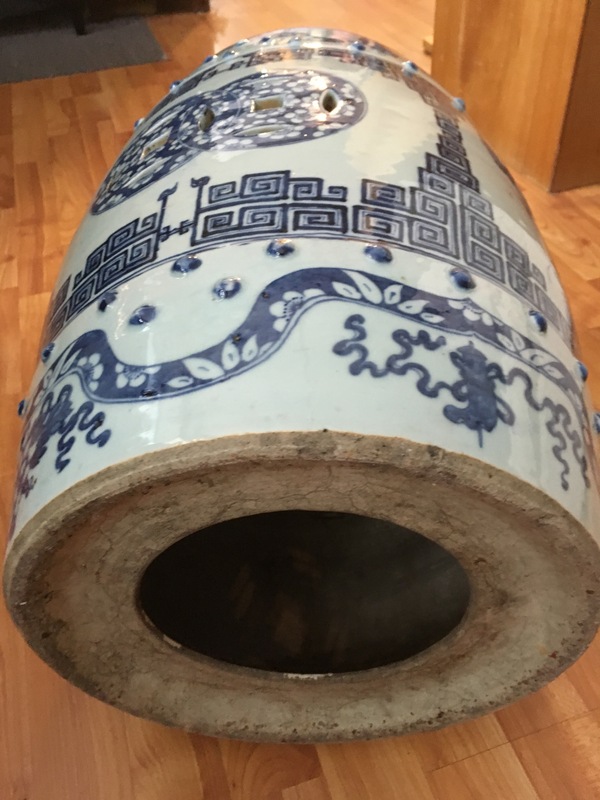 The swelling body of the barrel is divided into three decorative parts, with the widest part set between raised bosses. This part is painted with alternating designs of pierced double cash and pictorial designs of birds and flowers. The bird on one side is a peacock with a cherry blossom branch and on opposite side is of two song birds with the peony. These designs together signify wealth and nobility. These pictorial paneled areas are bordered with double key-fret diapers. The top section shows four of eight Buddhists emblems among a twining ribbon scattered with cherry blossom petals, below a trellis-diaper and a bead-droplets diaper. The bottom section shows four more Buddhist emblems among a ribbon with flower petals. Ribbon signifies a wish for good fortune to come down from heaven. This garden seat is in excellent condition. Its antiquity is proven by age-old soiled crackling lines at the bottom of the barrel. Authentic clear blue-and-white antique porcelain garden seats are quite hard to find today.